Yay Why did mkw-ana not work then? Please tell me your real FC. btw, do you know "mkw-ana update"? Forgot to say, that the update command uses an already installed wget. Please do not PM me. If you PM me without valid reason, I will block you from doing so. Thank you. It's available since v1.04 (not sure), only tested for Linux and only documented in the built-in help. The UPDATE command connects Wiimmfi to get its infos about the games and *add* it to the files. It's available since v1.04 (not sure), only tested for Linux and only documented in the built-in help.The UPDATE command connects Wiimmfi to get its infos about the games and *add* it to the files. Ah. maybe add a wget.exe in mkw-ana? eternallybored.org/misc/wget/ - place 32bit in. Are you sure, that 5240-8719-3659 is correct? Because it is reduced to PID 101183547, a very old profile id. //offtopic @Wiimm would there be a way to built a live feed of people connecting and disconnecting from MKW using 'mkw-ana query --brief --wiimmfi'? The post was edited 1 time, last by PokeAcer ( Jul 21st 2015, 5:46pm ). Welp looks like I wrote down the wrong one because I was in a hurry ( night shifts :c ). It probably isn't @Marteicos - his Mii is Starius. Has anyone tested, if the FC convert works for Strikers? Wiimm, it doesn't matter because MSC cannot have region locked fixed, because the goalie AI is different between NTSC/PAL/Japan. So starting a game between regions ends up with immediate disconnection. It wont work, FCs themselves don't work. @All can somebody do a packet dump of connecting to Wiimmfi on MSC, adding someone, checking which should give you an error, then dc'ing, then PN it me? I wanna see if it's using SAKE for regions, in which case I'll try fixing it on my beta SAKE server. EDIT: and it doesn't even recognize the game. As friendrooms between old friends apparently work I just need the savegame of at least one of them. After I find out where it saves the required data I can publish how to enable friendrooms manually and then someone can do a Wii program to do it. Maybe it's an error between the two PAL versions of the game? Maybe. I just want to confirm, say, that it's not a problem with the new code I've written or anything of the sort. Frankly , I prefer the way this makes it easy to find opponents so !! I just encountered the same guy you mentioned and also got the same Network Synchronisation Error right after the match was about to begin. Well bad news. I now know pretty much 90% of the online savegame of MSCF thanks to a Savegame provided by Maschell. The game does not save your Wins/Loses against your friends or the region of your friends. 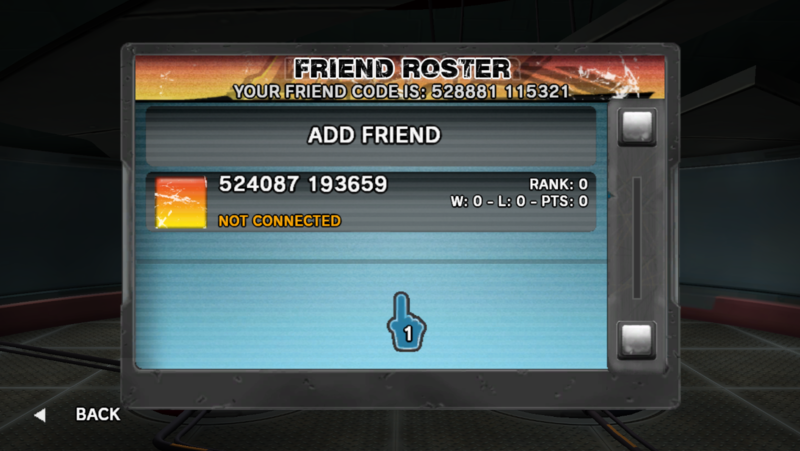 It only saves the Name of your friends, their Player ID and whether both parties have added each other. @MrBean35000vr Could your Cheatcode disable too much maybe? @Tock I don't think so. It merely alters the login procedure so the call to the method that connects to the Gamestats server is never made (first line), and also so the game doesn't wait for the leaderboard information (final three lines) since all of that is done in the background.